Over 62 area businesses offered generous donations in support of the event, held this Saturday night at the Polk County Fairgrounds in Rickreall, Oregon. The 4H Spaghetti Feed was hosted by area Polk County 4-H Clubs, including The 4-H Achievers, Spring Valley Riders and Small Animal Express. Polk County event organizers with the 4-H Achiver's Club pictured L to R:Lori Smith (parent), Zachary Odegard, Sierra McBeth and Debbie Macbeth (parent). Zachary and Sierra were instrumental getting donations for the auction and dinner at tonight's event. Dinner was prepared by Tater's Cafe of Dallas. The colorful array of events included cake walk, games, 50 silent auctions items, and two bike raffles. Proceeds for the event went to the 2009 Polk County Relay for Life to support the American Cancer Society. What people are saying at West Coast Farm Shows. Water is a huge problem. The 600,000 irrigated acres in the San Juaquin Valley will soon turn into 200,000 acres. This is because of drought conditions. Almond growers, particularly in the West area of the valley anticipate loosing their crops and businesses because there are not enough water acres to retain their orchards. This in an economic depression will make thing in California that much worse. Many farmers are turning to special crops to survive, using organics, using less water. The cost of protein in the market place is leaving the United States less competitive in recent months. Proteins as world wide commodities traditionally have been very stable. Recently though other countries have been able to target our market competitively. There are two factions of farmers out there, some who wax “Green” in their philosophy, others who are opposite. Myself, I am still not sure really what green means. It seems to be a popular term in Portland now, but most certainly lacks clarity, but seems to be he vogue thing. There seems to be less chemical companies at all farm shows. We are a nation becoming less competitive in the food marketplace. If you thought you hated the thought of high gas prices and thought that made our Nation insecure, wait until we import the highest percentage of our food. Food is becoming a National Security issue. Efficient dairies are making alot of money. However, fewer people though are willing to own and operate them. Myself and Jeff Moggenburg ready our papers for distribution here on the first morning. This year we are ready with almost twice as many Capital Press newspapers and Ag Ads this year. In addition to the Capital Press showcase booth in Pavilion C, we have racks place at all information booths at the World Ag Expo in Tulare. Quiet before the storm. 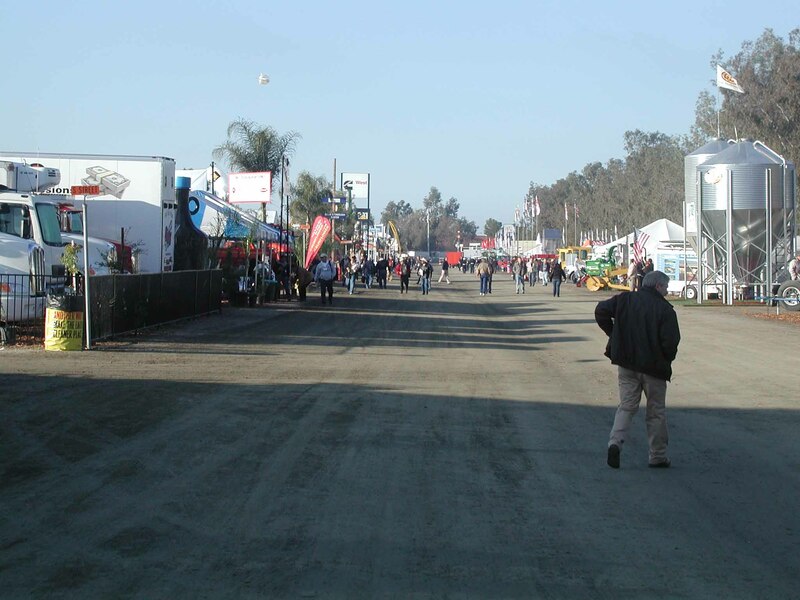 Vendors quickly make way to their locations in order to ready displays for the first day at the World's largest farm show in Tulare. Feeding Bankers? Start building your Chicken Coop. Feeding Bankers? Better build your chicken coop now. Corporations have outsourced manufacturing to China, services to India, and food to foreign countries. With impending draught, middle class Americans who can grow their own food by square foot gardening or trade for be able will survive. The economy is in the dump because of lack of manufacturing, services and car sales. The bailout will not generate that. Banks are no longer trustworthy. Insurance companies are worse. Pharmaceutical companies have such a huge lobby they are immune even to the nation’s largest lobby groups, the AARP and the American Medical Association. Sure we benefit from rebuilding bridges and roads. But how is that going to put create a product that people will buy, and we can export? My personal feeling is no amount of money will save the economy. Money is not the reason there is a lack of jobs. Outsourcing is. We now lack original products and services that make us globally competitive, and domestically secure. So, how many cups of soup can a trillion dollars buy over 10 years? There may come a time when we need to feed to poor, and not rich bankers. Oranges are imported from Brazil. And now Oregon, the World wide provider of hazlenuts is importing them from Chile. When will it stop? Maybe. But for now, hotels are empty, travel is down, and airlines are hurting more than ever. I say save bailout for the people. We will need it sooner than you think. Ask California state employees that are being furloughed this week. We’re seeing the tip of the iceberg. Oh yeah. Another thing. My great grandmother survived the depression because she had chickens. If we keep on feeding bankers with bailout money, we might as well start building chicken coops. Interesting World view post on the power of food in politcally comprimised nations.